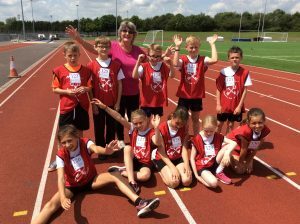 On 14th June, 10 children from class 4 took part in a Quad Kids competition at Tilsley Park. We were competing against children from schools all over Abingdon. Each child competed in standing long jump, 75m sprint, 600m run and howler throwing. Eight children also took part in a relay race. All our children did amazingly well – as a team we came 10th out of 16 teams.